Late-night eats: Chinese-American chicken 'n' waffle fries from Junzi's weekend-only after-hours menu. The primary dip for my fries was an aioli, tweaked with Cantonese sweet vinegar, into which fried black bean sauce was blended; a secondary dip, surplus sesame chili sauce laced with pumpkin-spiced chili oil, pooled beneath General Chu's chicken. Previously: The original Junzi, like this newer location near Columbia University, makes its home in an Ivy League neighborhood; pizza aficionados will make the New Haven connection at once when they come upon the huddled ranks of Foxon Park sodas. Tomato-pork noodles and their thatch of garlic chives might pair well with a cup of Junzi's jasmine, oolong, or gunpowder rose tea, but how ever to know when white birch is so close by? After-hours menu served in both locations on Friday and Saturday nights, 10:30 p.m.-1:30 a.m.
Clam pie, cheeseless, featuring shucked-to-order littlenecks (medium, $30.50). With other toppings I'd be inclined to order well-done, but why risk overcooking and toughening the shellfish or drying out the juices that soak into the crust? The house got this one just right. Two small slices remained only because this was the fourth of four stops on a pizza crawl; I understand that leftover clam pie, too, is quite good. Also shown: Iron Brew, the most enigmatic of the Foxon Park sodas found in all respectable New Haven-area pizzerias. Its flavor, the company's website acknowledges, is "tough to describe. ... Do you like Kola? Do you like Cream? Do you like Root Beer? Then Iron Brew is the drink for you!" I preferred the white birch flavor, and its hints of wintergreen, which we paired with another pizza earlier in the day. The classic version of Pepe's celebrated white clam pizza relies principally on garlic and olive oil, as well as oregano and grated cheese, to coax out extra shellfish flavor. A mozzarella-laden version is available, but frowned on; tomato sauce is out of the question, hence the designation "white" clam. When one member of our pizza-crawl crew insisted on bacon, all sorts of permutations presented themselves. The most concise solution: half bacon with mozzarella (shown above), half white clam, with garlic and olive oil, and more bacon (shown below; large, $25.75). Also shown, from a previous visit: a small white clam pie (currently $12.75). The slightly irregular shape is typical of New Haven pizzas, which often are oblong rather than round; the camera angle exaggerates this only a little. If you enjoy the chewy crust at Pepe's, the proportions are perfect. Despite the puffy lip and the blackened, burst air pockets, most of this crust was not only thin and chewy but also floppy. (A member of our pizza-crawl crew with knowledge of the situation said this is standard at Modern.) Our large pie ($17) exhibited topping slippage, less on the half with slices of hot cherry peppers (not shown here) than on the half with sausage, which had been crumbled atop the mozzarella and sauce in generous, irregular chunks. That's what fingers are for. First thoughts when planning a visit to New Haven often involve pizza, or a pizza crawl. On second thought, consider a good mee goreng mamak, Indian-inspired Malaysian fried noodles that are ideally made a la minute and served while still sizzling. 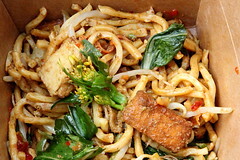 Unfortunately, a tented market in Bryant Park can't accommodate the same stir-fry flourishes as a streetside operation in Penang; console yourself with well-balanced ingredients such as flowering yu choy. Next time, fresh-fried. 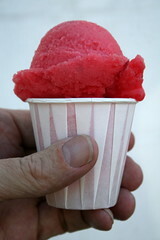 A cranberry ice (small; $1.25) bore little bits of fruit; somewhat tart.